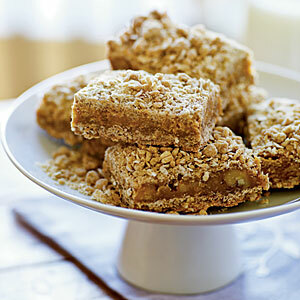 Try this rich and delicious butterscotch bar recipe. It’s quick and easy, and a party favorite – for adults and children. People are sure to ask you to bring this desert favorite. Heat condensed milk in saucepan (don't boil). Stir in Gurley's Butterscotch Chips, Coconut, and Nuts. Stir for 15 seconds and spread evenly in pan. Sprinkle remaining crumb mixture and pack down tightly. Bake 30-35 minutes or until lightly golden brown.